Alanine (symbol Ala or A) is an α-amino acid that is used in the biosynthesis of proteins. It contains an amine group and a carboxylic acid group, both attached to the central carbon atom which also carries a methyl group side chain. Consequently, its IUPAC systematic name is 2-aminopropanic acid, and it is classified as a nonpolar, aliphatic α-amino acid. Under biological conditions, it exists in its zwitterionic form with its amine group protonated (as −NH3+) and its carboxyl group deprotonated (as −CO2−). It is non-essential to humans as it can be synthesised metabolically and does not need to be present in the diet. It is encoded by all codons starting with GC (GCU, GCC, GCA, and GCG). The L-isomer of alanine (left-handed) is the one that is incorporated into proteins. L-Alanine is second only to leucine in rate of occurrence, accounting for 7.8% of the primary structure in a sample of 1,150 proteins. The right-handed form, D-Alanine occurs in polypeptides in some bacterial cell walls:131 and in some peptide antibiotics, and occurs in the tissues of many crustaceans and molluscs as an osmolyte. Alanine was first synthesized in 1850 by Adolph Strecker. The amino acid was named Alanin in German, in reference to aldehyde, with the infix -an- for ease of pronunciation, the German ending -in used in chemical compounds being analogous to English -ine. Alanine is an aliphatic amino acid, because the side-chain connected to the α-carbon atom is a methyl group (-CH3), making it the simplest α-amino acid except for glycine. The methyl side-chain of alanine is non-reactive and is therefore hardly ever directly involved in protein function. Because alanine's side-chain cannot be phosphorylated (only compounds like 3-Phosphino-L-alanine and 3-Hydroxyphosphinylalanine are known), it is useful in loss of function experiments with respect to phosphorylation. Some techniques involve creating a library of genes, each of which has a point mutation at a different position in the area of interest, sometimes even every position in the whole gene: this is called "scanning mutagenesis". The simplest method, and the first to have been used, is so-called "alanine scanning", where every position in turn is mutated to alanine. Alanine is a nonessential amino acid, meaning it can be manufactured by the human body, and does not need to be obtained through the diet. Alanine is found in a wide variety of foods, but is particularly concentrated in meats. Alanine can be synthesized from pyruvate and branched chain amino acids such as valine, leucine, and isoleucine. Alanine is most commonly produced by reductive amination of pyruvate, a two-step process. In the first step, α-ketoglutarate, ammonia and NADH are converted by glutamate dehydrogenase to glutamate, NAD+ and water. In the second step, the amino group of the newly-formed glutamate is transferred to pyruvate by an aminotransferase enzyme, regenerating the α-ketoglutarate, and converting the pyruvate to alanine. The net result is that pyruvate and ammonia are converted to alanine, consuming one reducing equivalent. :721 Because transamination reactions are readily reversible and pyruvate is present in all cells, alanine can be easily formed and thus has close links to metabolic pathways such as glycolysis, gluconeogenesis, and the citric acid cycle. Racemic alanine can be prepared by the condensation of acetaldehyde with ammonium chloride in the presence of sodium cyanide by the Strecker reaction, or by the ammonolysis of 2-bromopropanoic acid. This latter method was developed as an alternative to the Strecker approach, which had been described as "excellent but tedious." In mammals, alanine plays a key role in glucose–alanine cycle between tissues and liver. In muscle and other tissues that degrade amino acids for fuel, amino groups are collected in the form of glutamate by transamination. Glutamate can then transfer its amino group to pyruvate, a product of muscle glycolysis, through the action of alanine aminotransferase, forming alanine and α-ketoglutarate. The alanine enters the bloodstream, and is transported to the liver. The alanine aminotransferase reaction takes place in reverse in the liver, where the regenerated pyruvate is used in gluconeogenesis, forming glucose which returns to the muscles through the circulation system. Glutamate in the liver enters mitochondria and is broken down by glutamate dehydrogenase into α-ketoglutarate and ammonium, which in turn participates in the urea cycle to form urea which is excreted through the kidneys. The glucose–alanine cycle enables pyruvate and glutamate to be removed from muscle and safely transported to the liver. Once there, pyruvate is used to regenerate glucose, after which the glucose returns to muscle to be metabolized for energy: this moves the energetic burden of gluconeogenesis to the liver instead of the muscle, and all available ATP in the muscle can be devoted to muscle contraction. It is a catabolic pathway, and relies upon protein breakdown in the muscle tissue. Whether and to what extent it occurs in non-mammals is unclear. Alterations in the alanine cycle that increase the levels of serum alanine aminotransferase (ALT) are linked to the development of type II diabetes. The deamination of an alanine molecule produces a stable alkyl free radical, CH3C•HCO2−. Deamination can be induced in solid or aqueous alanine by radiation that causes homolytic cleavage of the carbon–nitrogen bond. This property of alanine is used in dosimetric measurements in radiotherapy. When normal alanine is irradiated, the radiation causes certain alanine molecules to become free radicals, and, as these radicals are stable, the free radical content can later be measured by electron paramagnetic resonance in order to find out how much radiation the alanine was exposed to. This is considered to be a biologically relevant measure of the amount of radiation damage that living tissue would suffer under the same radiation exposure. Radiotherapy treatment plans can be delivered in test mode to alanine pellets, which can then be measured to check that the intended pattern of radiation dose is correctly delivered by the treatment system. ^ Haynes, William M., ed. (2016). CRC Handbook of Chemistry and Physics (97th ed.). CRC Press. p. 5–88. ISBN 978-1498754286. ^ Doolittle, Russell F. (1989). "Redundancies in Protein Sequences". In Fasman, Gerald D. (ed.). Prediction of Protein Structures and the Principles of Protein Conformation. New York: Plenum. pp. 599–623. ISBN 0-306-43131-9. ^ a b c Mathews, Christopher K.; Van Holde, Kensal Edward; Ahern, Kevin G. (2000). Biochemistry (3rd ed.). San Francisco, CA: Benjamin/Cummings Publishing. ISBN 0805330666. OCLC 42290721. ^ Yoshikawa, Naoko; Sarower, Mohammed G.; Abe, Hiroki (2016). "Alanine Racemase and D-Amino Acid Oxidase in Aquatic Animals". In Yoshimura, Tohru; Nishikawa, Toru; Homma, Hiroshi (eds.). 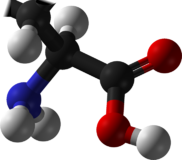 D-Amino Acids: Physiology, Metabolism, and Application. Springer Japan. pp. 269–282. ISBN 9784431560777. ^ Strecker, Adolph (1850). "Ueber die künstliche Bildung der Milchsäure und einen neuen, dem Glycocoll homologen" [On the artificial formation of lactic acid and a new substance homologous to glycine]. Annalen der Chemie und Pharmacie (in German). 75 (1): 27–45. doi:10.1002/jlac.18500750103. Strecker names alanine on p. 30. ^ Strecker, Adolph (1854). "Ueber einen neuen aus Aldehyd – Ammoniak und Blausäure entstehenden Körper" [On a new substance arising from acetaldehyde–ammonia [i.e., 1-aminoethanol] and hydrocyanic acid]. Annalen der Chemie und Pharmacie (in German). 91 (3): 349–351. doi:10.1002/jlac.18540910309. ^ "Alanine". AminoAcidsGuide.com. 10 June 2018. Retrieved 14 April 2019. ^ "alanine". Oxford Dictionaries. Retrieved 2015-12-06. ^ Textbook of Biotechnology. McGraw-Hill Education (I). 2012. ISBN 9780071070072. ^ Pubchem. "Alanine, 3-(hydroxyphosphinyl)-". pubchem.ncbi.nlm.nih.gov. Retrieved 20 September 2018. ^ Park, Sheldon J.; Cochran, Jennifer R. (2009-09-25). Protein Engineering and Design. CRC Press. ISBN 9781420076592. ^ Kendall, E. C.; McKenzie, B. F. (1929). "dl-Alanine". Organic Syntheses. 9: 4. doi:10.15227/orgsyn.009.0004. ; Collective Volume, 1, p. 21 . ^ Tobie, Walter C.; Ayres, Gilbert B. (1937). "Synthesis of d,l-Alanine in Improved Yield from α-Bromopropionic Acid and Aqueous Ammonia". Journal of the American Chemical Society. 59 (5): 950. doi:10.1021/ja01284a510. ^ a b Nelson, David L.; Cox, Michael M. (2005), Principles of Biochemistry (4th ed. ), New York: W. H. Freeman, pp. 684–85, ISBN 0-7167-4339-6 . ^ Fish Physiology: Nitrogen Excretion. Academic Press. 2001-09-07. p. 23. ISBN 9780080497518. ^ Walsh, Patrick J.; Wright, Patricia A. (1995-08-31). Nitrogen Metabolism and Excretion. CRC Press. ISBN 9780849384110. ^ Sattar, Naveed; Scherbakova, Olga; Ford, Ian; O'Reilly, Denis St. J.; Stanley, Adrian; Forrest, Ewan; MacFarlane, Peter W.; Packard, Chris J.; Cobbe, Stuart M.; Shepherd, James (2004). "Elevated Alanine Aminotransferase Predicts New-Onset Type 2 Diabetes Independently of Classical Risk Factors, Metabolic Syndrome, and C-Reactive Protein in the West of Scotland Coronary Prevention Study". Diabetes. 53 (11): 2855–2860. doi:10.2337/diabetes.53.11.2855. PMID 15504965. ^ Zagórski, Z. P.; Sehested, K. (1998). "Transients and Stable Radical from the Deamination of α-Alanine". J. Radioanal. Nucl. Chem. 232 (1–2): 139–41. doi:10.1007/BF02383729. .
^ a b Pedro, Andreo; Burns, David T.; Nahum, Alan E.; Seuntjens, Jan P.; Attix, Frank H. (2017). "Alanine Dosimetry". Fundamentals of Ionizing Radiation Dosimetry (2nd ed.). Weinheim, Germany: Wiley-VCH. pp. 547–556. ISBN 9783527808236. OCLC 990023546.